We've all seen and heard of amazing cryptocurrency pump and dumps! Fortunes won and lost in hours and even minutes! Ethereum's recent rocket ride from from under a buck in Jan to $15 in March is the latest example. And who could forget Bitcoin's insane explosion in late 2014 when it shot from $120 in October to $1200 in November? A ten bagger over a month! That's the kind of legendary profit a trader in regular markets is lucky to see once in his lifetime! But they're a common occurence in crypto markets! There's like 100 other coins I could mention which went from rags to riches (and loads that went right back to rags again). Some other good examples are Litecoin and Auroracoin. So I'd like to know, what's the best way to profit from these pump and dumps which seem to be happening all the time in tiny coins nobody's ever heard of? Also how to know which of the major (say top 30) coins is going to be next to rise really quickly? 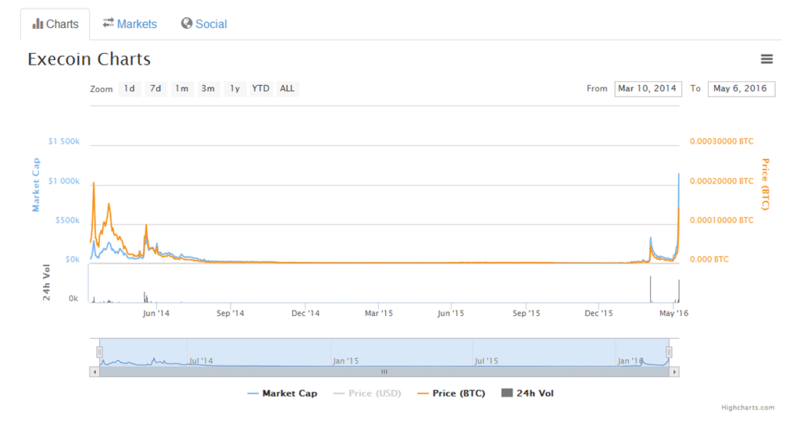 It’s understandable that people get excited when looking at pump and dump price charts. They imagine the fortune they might have made, if only they’d gotten in early and sold at the top. 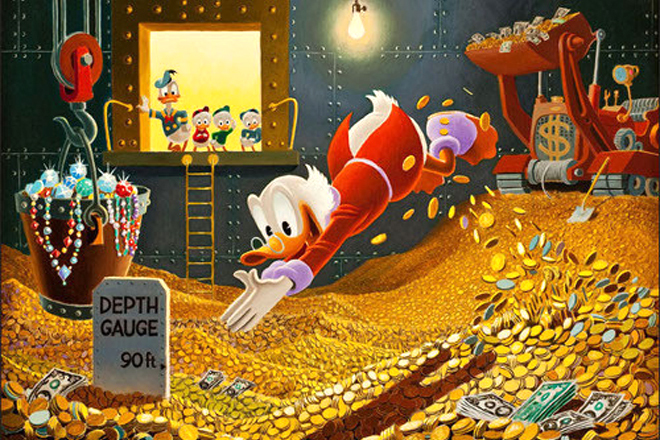 Their minds soon start swimming in this imaginary fortune, like Scrooge McDuck in his money bin. Sure, the price spikes from major pump and dumps, like those you mentioned, are often nothing short of astonishing. The moves are so wild that they’re less likely to be measured in percentages than in multiples. Certainly, it’s hard to resist 10 or 20 times your money back! Beware. This temptation often leads to ruin. Natural caution and critical thinking are overloaded by greed. The result is often similar to getting drunk in a casino. Imagine the movie The Hangover but without the laughs or happy ending. One crazy ride later, you’re left broke and wondering what happened. Just why did you think that was a good idea? The truth is that pump and dumps are a form of market manipulation, even a conspiracy against the market. There’s a good reason such activities are illegal in more regulated markets, such as penny stocks! As a side-effect of the otherwise appealingly lawless nature of cryptocurrencies, unscrupulous actors are fairly unrestrained in their little schemes. Only knowledge of such things will keep crypto newbies safe, as there's no Nanny State to step in and protect her babies. So let's be clear about things: unless you’re in on the pump and dump operation from the very beginning, you’re taking a major financial risk by getting involved. Only ever risk money you're willing to lose and consider it exactly as you would a bet on a game of cards. All that said, once you know how P&Ds operate, you can sometimes go along for the ride. Like anything in the markets, doing so takes a lot of luck, a lot of hard work or a bloody good contact. @WorthySpike ok so how do I go about making money from them?! Classic flatline then a major spike as the P&D defibriliator is applied! I happen to own some EXE from the old mining days, so I'm currently trying to sync up my wallet, transfer my "stash" to Poloniex and sell the damn things. Seems EXEcoin was abandoned by its dev a while ago and trading halted on Poloniex. I'm battling to find live nodes so it's taking ages to sync... Found some nodes! It's still slow going though. @WorthySpike What is dead may never die. I think it's always a good idea to consider buying a coin that is declared dead or has hit a steady bottom (or a flatiline like you said). It's so easy for any whale to come along and start a pump. Might as well get the cheap coins and potentially join the ride up. It can sometimes take months but it's well worth the wait. Look at litecoin over this past year. It clearly hit a bottom and could not make any more significant legs down. I figured it was a good time to buy in April and surely enough it has broken out upwards. 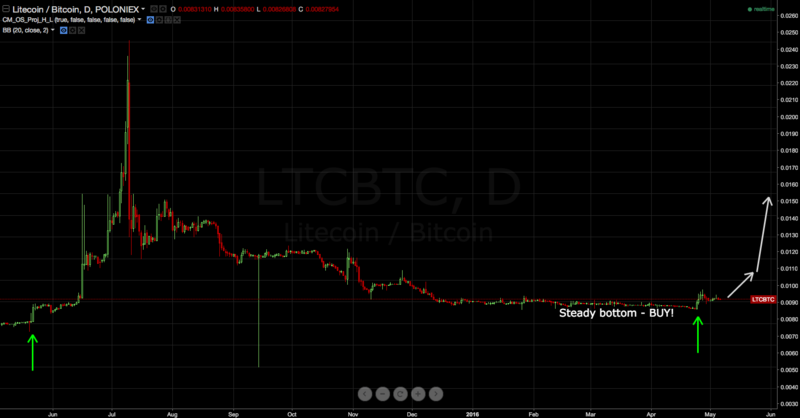 I think it still has a long way to go up, given how dramatic the previous litecoin pumps were. Also, before the last year's pump we had some similar activity. But I'm not a trading expert, maybe you can elaborate on this idea Master. active dev (team): this is best judged by the coin's Github page. Look for recent and frequent code improvements. fair launch: you'll have to examine the coin's announcement thread. Avoid heavily pre-mined coins or ICO (Initial Coin Offering; like a stock Initial Public Offering but often even shadier) coins. good reputation: this is best gleaned from discussion threads. Avoid coins with known scammer involvement, just on general principle. Litecoin (LTC) is well-established as the first Scrypt-based alternative to Bitcoin. LTC is (fairly) actively maintained by a well-known and respected developer, with solid connections to both Coinbase (where he works as CTO) and BTC China (run by his brother). LTC has a respectable market cap of $180m and trades just under $4, doing so on $2m worth of volume over the last 24 hours. It also has an active and enthusiastic community. By contrast, Execoin (EXE) is a clone of Vertcoin which brought little innovation to the crowded altcoin market besides the first Electrum wallet with "stealth address technology." I don't follow the chatter around altcoins closely but I don't think that techh made much of an impact. EXE currently has a decent market cap of about $550k and is priced just under 3c (US). It's currently ranked at #91 on CoinMarketCap. It's certainly no joke-coin but, unlike Litecoin, it's certainly doesn't qualify as a serious contender to the top 10. So yeah, given EXE seems to be enjoying a final gasp before it collapses, Litecoin is certainly a better prospect. As for holding LTC against a potential pump, I'd say that's a gamble worth taking although I wouldn't bet the farm on it either. I believe there are still a lot of Litecoin bagholders (those who bought in at higher prices previously and waiting for price to recover in order to close out their trade profitably), so any pump would require a serious investment by whales (that is, high net worth individuals who actively trade these markets) to overcome those sellers. I can see Litecoin hype starting up if it pushes past that 0.0110 level and shifting into high gear if it breaks 0.0120. Let's go with @TheGuideGuy's sensible method of buying or mining likely coins and holding them against the eventuality of either a P&D or a legitimate increase. P&Ds are always short-term schemes based on hype and market manipulation. This distinguishes P&Ds from "genuine" price increases due to rising market demand related to a coin's future prospects. After selecting a suitable coin, as per the criteria mentioned above (development and community activity, tradeable liquidity, fair launch and good or neutral reputation), your first point of consideration should be volume. Examine the coin's launch and blockchain; try to form a picture of the coin's current distribution. The newer the coin, the simpler this process will prove. Most coins launch with block explorers; identifying exchange addresses and looking for concentrated outflows to single "whale" addresses can yield important clues. Now monitor the coin for the following pattern: steady, flat price on subtly increasing volume. As @TheGuideGuy showed with Litecoin, that's often a clue that the coin is being accumulated for a P&D operation. Place your bets accordingly (and remember, bets are exactly what they are). As I demonstrated with my Execoin experience, proper portfolio management is critical to your ability to sell your coins in a timely fashion. The spike phase of a P&D can complete extremely quickly, literally minutes, so you can't afford to receive a late notification or sync your coin. The way I handled the EXE P&D is a fine example of what not to do: I only heard of its price rise by luck when another trader mentioned it. I then experienced a long delay when syncing my half-forgotten EXE wallet. Finally, even more time was wasted in transferring the coin to the exchange. Poloniex EXE deposits required a ridiculous 500 confirmations (although the coin's blocktimes are only 45 seconds, this still took about 6 hours). By the time I was ready to sell, the P&D was over. I recommend using a site or app which will send you notifications when your chosen coins' price and/or volume cross a certain threshold. I further recommend that you store your coins in a light wallet, which have the advantage over full wallets in that they sync nearly instantly. As for sending your coins to the altcoin exchange, this is something of an art. As altcoin exchanges can be rather unreliable, if not outright fraudulent, it's best not to entrust too much value to them. Balance custodial risk against quick trade execution. If the developer has significantly pre-mined the coin, be aware that they're able to stifle any prospective P&D by overwhelming the market with selling volume. Such developers, or dev teams, establish themselves from the outset as price manipulaters. This is one of many good reasons to avoid pre-mined coins; they establish a centralised or cornered market. Developers are often the biggest pumpers of their coins, whether working alone or in coordination with a pumping crew. 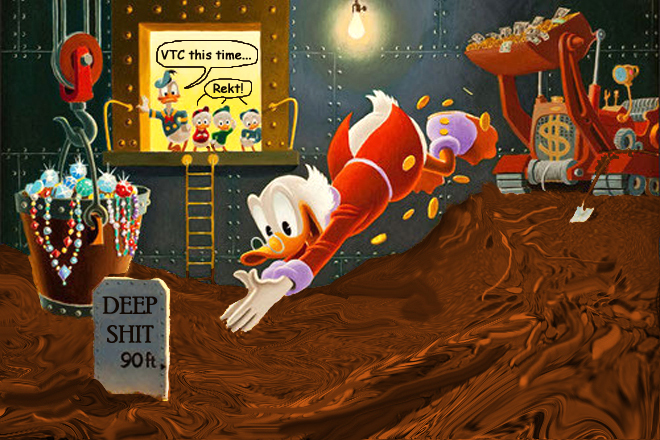 In fact, many "shitcoins" are created for the sole purpose of conducting a profitable P&D. These coins are abandoned soon after the P&D is concluded. As in all P&D's, the coin's price is artificially inflated by hype and market manipulation, then as much volume as possible converted as quickly as possible into Bitcoin. As there's really no way to determine from whether a pre-mined coin is being prepared for a P&D, it's best to avoid such coins. Note that pre-mines can be disguised in several ways. For example, DASH launched with "faulty" code which led to 32% of total supply being mined over the first two days. Releasing incorrectly-configured mining software is another trick by which insiders, who keep the efficient mining software to themselves, unfairly advantage themselves over the general public. Finally, ICO coins should be viewed with skepticism as they're often engineered to give only the appearance of fairness. What often happens in an ICO is that insiders buy up substantial volume only to earn their purchase price back by providing over-priced "services" for the coin, such as website creation, coding or "consulting."